Vehemently protecting a brand never looked so kind. Jack Daniel’s wrote what’s possibly the friendliest cease-and-desist letter ever to author Patrick Wensink, whose new book cover looks conspicuously like the whiskey bottle. Sure, each bottle of Jack Daniel’s has been adorned by that black label since 1911, making it a pretty widespread cultural icon. But that doesn’t mean its design is free for the taking — and the cover image, to be sure, has all the flourishes of that classic label. 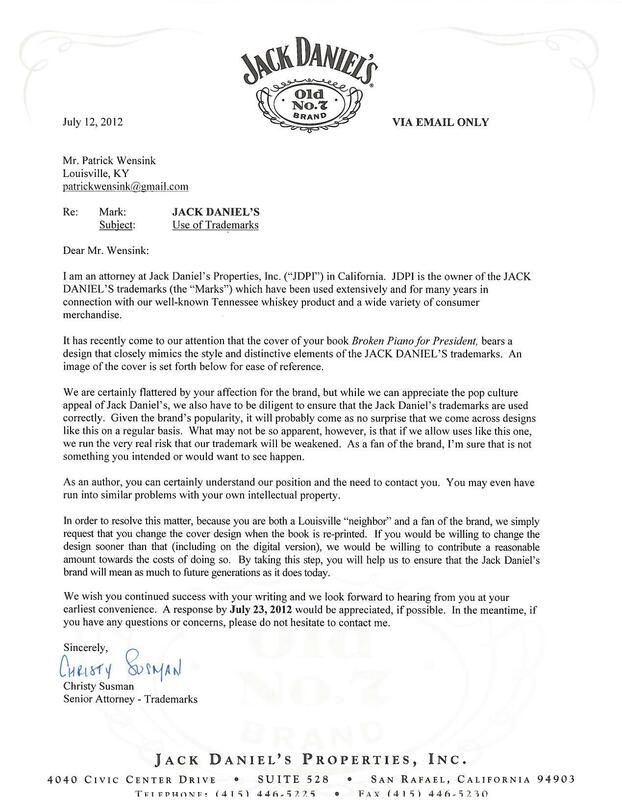 Which is why Jack Daniel’s Properties, keeper of the brand and its image, sent the cease-and-desist notice to Wensink. But the contents of the letter hardly stood up to the harrowing name of the legal document: The company demanded nothing, only politely asking that he switch up the cover at the next printing. The whiskey purveyor has also offered to help defray the cost of a new design. While Wensink wrote on his website he has no plans on taking up Jack Daniel’s on “any of that sweet corporate booze money to redo the cover,” he is planning to freshen the look, if only to keep a friend in Jack Daniel’s. After all, they wished him “continued success” in his writings. Of course, all this publicity will certainly only serve to help Wensink and potentially push his book to a new printing sooner, rather than later (or never). See, doesn’t that make getting slapped with a a legal document sound so much smoother?